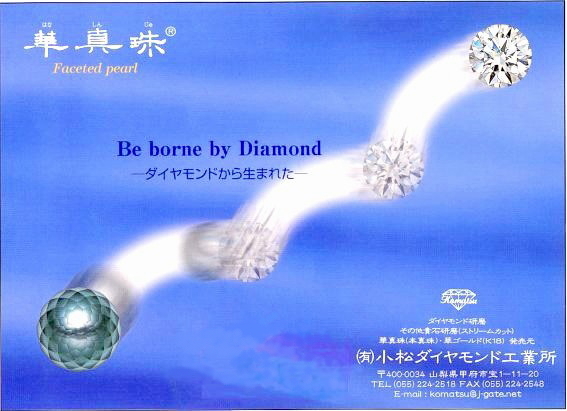 Komatsu Cutting Factory is the first company in the world to produce cut pearls. Established in 1966 as a diamond polisher, we have finally perfected a method of cutting pearls after 10 years of painstaking effort. We are now able to apply this process to all kinds of cultured pearls, from South Sea pearls to Mabe pearls. The Faceted Pearls process produces a cut surface that, although flat, appears to swell like a bubble. The beautiful inner layers of the pearl are visible through the surface of the cut, adding to the natural beauty of the pearl. Because the surface of the cut is highly polished the pearls can be handled in exactly the same way as ordinary pearls. the polishing process results in the natural luster of the pearl. We can cut any pearls you have, so please do not hesitate to discuss your requirements with us. We are now looking to build a worldwide network of sales agents for our Faceted Pearls processing factory. And offering to the Imperial family.